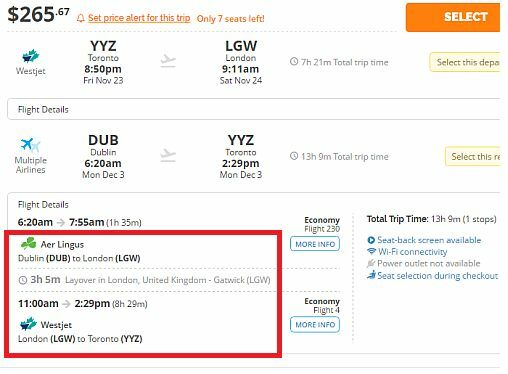 WestJet and Aer Lingus are showing open jaw flights that allow you to fly from Toronto to London, UK and then home from Dublin, Ireland for a total price of $265 CAD including taxes. Update @ 6:00 PM EST - It looks like these are gone. NOTE: Many other date combinations will work (shorter trips, longer trips, etc). Try any dates between November 9th and December 13th, 2018. Or any dates between Jan 10 and Feb 13, 2019. 9 Responses to "Toronto to London, UK and then home from Dublin, Ireland - $265 CAD including taxes"
Do you know if it's possible to just stay in London and hop on the return flight in London during the stop over? I am thinking the same thing. I dont think that should be a problem but would like to confirm. Definitely not! If you don't show up for your flight in Dublin they will cancel your ticket. Unfortunately no, you definitely can't do that. All airlines automatically cancel the remainder of your ticket once any leg is intentionally missed. Awesome! I just booked 2 tickets for my wife and I, amazing deal! Thanks Chris! Thanks for the heads up! I booked for a week for my husband’s birthday to visit our son in London. If anyone finds great deals for the London to Dublin journey, please pass along the info! I've been trying to book it all day but I keep getting 400 - 450 dollars? Am I doing something wrong? Thanks. We booked Nov 23-Dec 3. We are going to Dublin on the 30 for 3 nights. Could not find a dead cheap London to Dublin flight with our parameters simply because the early morning is too early for check in and such between accommodations especially as we are travelling with a kid. Paid $292 for the three of us but evens itself out. Must have gone quick because I was going back and forth on AirBnBs, most started disappearing. This is going to be our first adventure as a family. 2 adults and a 4 year old. I have only been on a plane once before and that was interprovincial 1 hour flight. Sorry for the rant. Thanks Chris! Is there any chance at all that this deal is still available? ?